As a SAHM I often feel less than professional in my daily attire. I wear a ponytail everyday. For me it is a MUST. This is just that season of life when I can't wear my hair down. 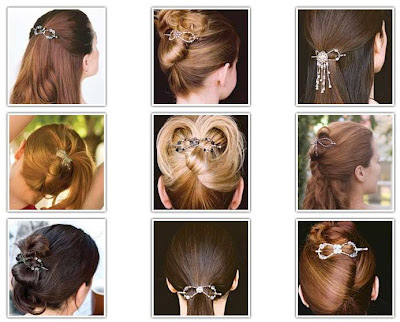 The Flexi clip is a completely unique, flexible barrette that holds thick, thin, curly, straight, fine and coarse hair. The Flexi comes in 6 sizes and hundreds of ever changing styles. Flexi uses an ingenious patented locking mechanism to secure it in your hair. Don't you want one? If 'yes,' go here to get one! I have been looking for a LONG time for a pretty barrette for my hair but nothing stays in. My hair is straight, slippery and very fine. All of the pretty ones were just too heavy. This, my friends in the solution! It is the solution if you have super thick hair or super fine hair. Go to the website and have a look at all of the beautiful choices! I fell in love and had a hard time deciding on the perfect one. So I guess I will just have to get a few more to add to my wardrobe! I started out with an extra small one to hold my regular ponytail. Now that I have it, I have learned that I need a small to twist up all of my hair. The most common size is small. One size does not fit all. You will need different sizes depending on the hairstyle you want to achieve. Anyway, there is a video on this website that will help you decide which size is best for you. This little wire contraption has done great things for me. My whole attitude is better because I feel better. I feel prettier. Sounds cheesy but it is true. Just wanted to share it with you too! Look what else you can do with it! Isn't it elegant? But yet useful for everyday use too! They're beautiful. Exactly what a mommy needs. I'll be choosing mine soon! Thank you! !